What if you could double your reading speed in two days? What if you could spend 7 minutes to build a better brain? If you want to read more books, or learn faster, or think faster, this might be one of the most important posts you ever read. I’m going to share with you a program that changed my life long ago, that I actually forgot about. 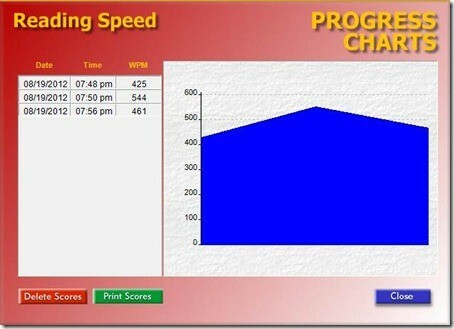 It’s a powerful program for reading, processing, and thinking at super human speeds. The program is called eyeQ Read and Process Faster in Just 7 Minutes, and I’ll explain why it’s such a big deal. First, here’s a quick story of what reminded me about eyeQ. One of my friends wanted to know how to keep up with us. A few of us in our “wolf pack”, scan and process information at extreme speeds. We’re fast. Very fast. After all, we work at Microsoft, and our survival depends on our ability to read, process, and use vast amounts of information on a daily basis. Because we can read and process faster, it’s easy for us to do things like, read a book in a day, keep our email inbox empty, or stay on top of information in our field. Reading faster has a lot of benefits. My favorite benefits are learning faster and spending less time in email. In the information age, the ability to read, process, and think faster is an extreme advantage. I had already showed my friend how to read faster, and how to organize email to read and process faster, but he was still hitting a glass ceiling. I realized it was because he was subvocalizing when he reads. He was also slowing himself down by his own reading and thinking habits he had built over a lifetime. Another thing that held him back from what he is capable of is simply that he did not know what is possible in terms of raw speed. Then I remembered eyeQ. And I realized this would be just the thing to help him get over his humps. eyeQ is a simple computer program that helps you develop high speed imaging skills. By learning how to image faster, you can read faster, type faster, and potentially improve your sports skills. It helps you read and scan information quickly without saying each word. As soon as I remembered eyeQ, I reinstalled it and did a quick test. 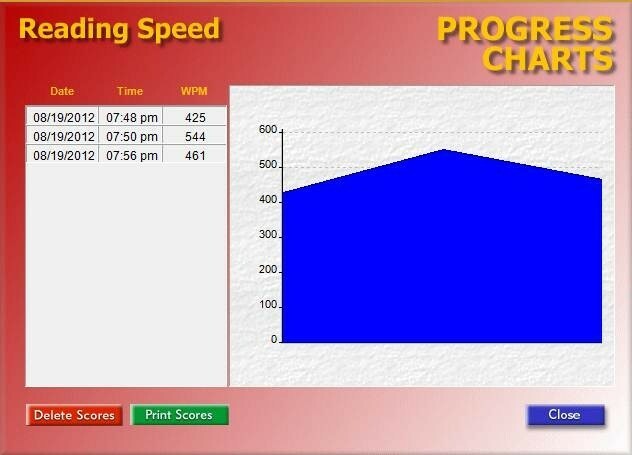 I was still fast, but I had slipped back to ~400 word per minute. 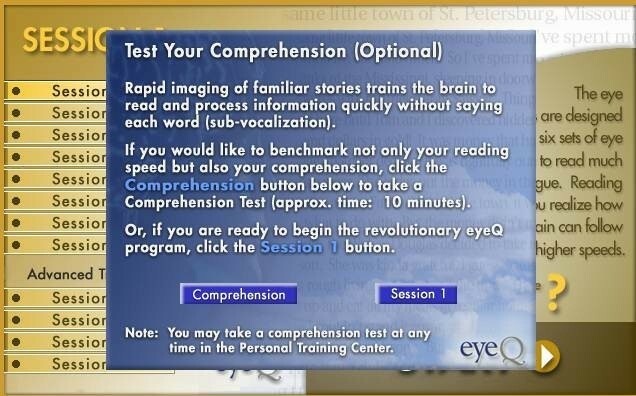 Back when I was using eyeQ, I was at more than 1,000 words a minute. This re-inspired me to start using eyeQ again and build my speed back up. I’m happy to say I’m back around 1,000 words a minute, and I’m going to continue to work towards 10,000 words a minute. I deal with a lot of information at work, so the faster I am, the more time I save, and the more I can spend my time on other things. “In first grade, I was diagnosed with amblyopia, commonly called ‘lazy eye.’ I struggled through grade school with a think lens on one eye, and a patch on the other. I was such a poor reader that I had read only five or six entire books by the time I graduated from college. In spit of this challenge, and through sheer determination, I climbed the corporate latter so success. My life further changed when I met Dr. Kawamura in 1996 and tested his brain enhancement techniques. Within two days, I doubled my reading speed. Within a month, I was reading four times faster. Now I read an average of a book per week. Excited about how eyeQ could help others, I secured the licenses to develop eyeQ into a Windows-based CD-ROM program that enables everyone to read and process information faster. eyeQ is simple and straightforward. It’s organized into 12 sessions. The first eight sessions help you build high speed imaging skills. 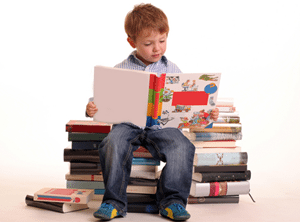 The four additional sessions are for those who want to read at more than 1,000 words per minute. Each session has three steps: 1) Pre-Test, 2) Exercises, and 3) Post-Test. 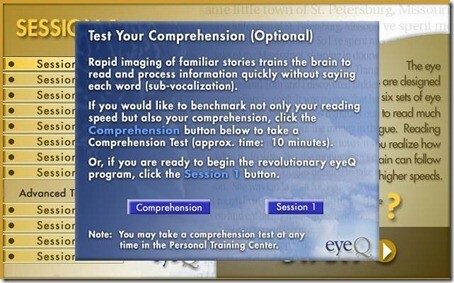 eyeQ also includes optional Comprehension tests. The personal training center includes Eye-Brain Enhancements and Reading Training. 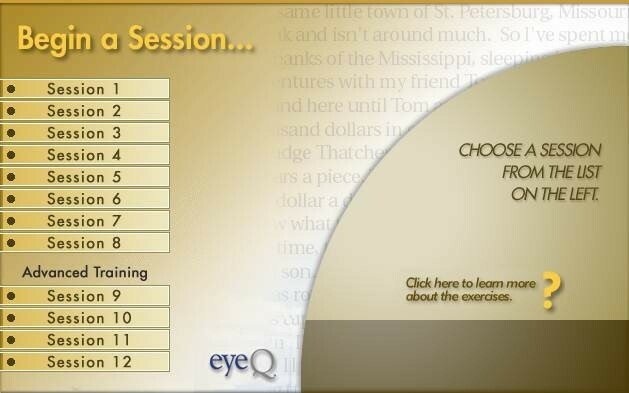 One of my favorite exercises in the training session is where eyeQ paces you, starting at 10,000 words per minute, and gradually slowing down to slower speeds. I think this was the key exercise that really showed me how to read much faster and move through much more information by changing my pace. It helped me see what is possible, and it was way faster than I had ever imagined on my own. Another feature that I like about eyeQ is the screen saver. It’s fun and effective. Throughout the day, when my screen saver goes off, I actually enjoy exercising my eyes and my mind with the screen saver. 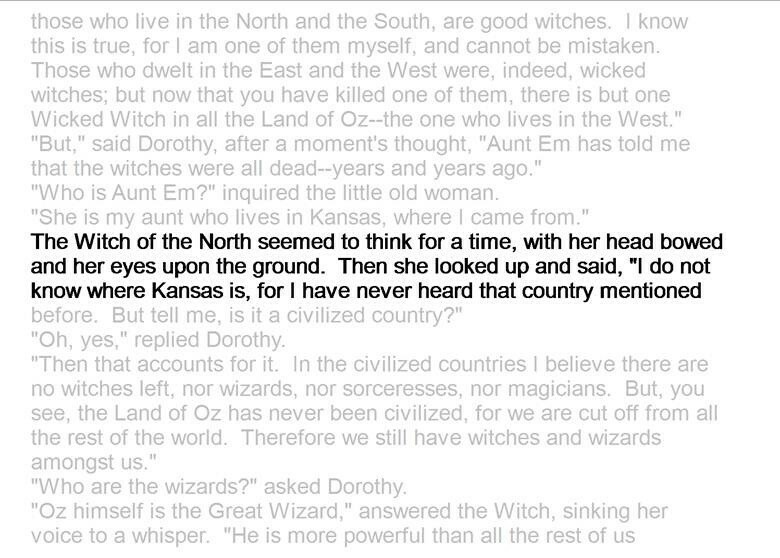 One of my favorite screen savers is where words randomly appear on different parts of the screen at different speeds and it teaches your eyes to scan and identify words. Overall, I find eyeQ to be a very simple program with instant impact and immediate benefits. Even if I never used eyeQ again, I now know what’s possible in terms of reading and thinking speeds, and I know what it’s like to scan information without subvocalizing. That’s a very big deal. It’s not a cheap program, but it’s one of the smartest investments I ever made. My time is worth money, and I deal with so much information every day. I find that the speed I gained pays me back every single day, whether it’s learning faster, reading more books, or doing my email faster. Maybe that’s the best way to think of eyeQ … it’s the gift of time. You can also buy eyeQ from Infinite Mind. Note that you eyeQ is available as a standalone application or as an Online Edition. I have the standalone application. If you approach eyeQ with the simple goals of train your eyes to read faster, learn how to think and process faster, and learn how to stop subvocalizing, I think you’ll fall in love with the program. More importantly though, I think you will unleash more of what you are capable of. Just like we upgrade our computers, I think this is perhaps the closest thing we can get to an “upgrade” of our minds in terms of speed and processing ability. Subvocalising is definitely what slows my reading. Does the program run on macs do you know? @ Evan — I didn’t see a Mac version, but best bet would be to give Infinite Minds a call to see what the options are. Most likely, if they don’t have a Mac version, they’ll recommend the online subscription, which is the direction I think they are headed. @ Alik — It is crazy. When you see the words zip by, it’s hard to imagine that you can absorb it at that pace. 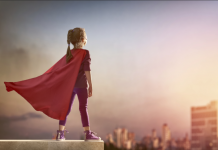 When I showed the program in action to a few folks, they noticed that starting faster, then slowing down, was surprisingly effective at building hope. What happens is you find yourself getting ahead when it starts to slow down, and you instantly recognize that you were capable of faster speeds than you originally thought you were. @ Hilary — When you own it, you can drive it, and one of the keys to life is driving from your lifestyle, while you live your values. Based on this article, I purchased the 1-year subscription to EyeQ. I just finished session 48, the last, 5 minutes ago. I bought this product based on the authority of JD. For the past 4 months I have been using his Power of 3 concept (from his Agile Results program) to great effect. Thank you, JD, for markedly improving my effectiveness and life satisfaction! Based on my extraordinary success using JD’s Power of 3 for daily, weekly, and monthly planning, I have created a Power of 3 plan for calendar year 2013. Each day I continue to be amazed at how such a simple idea can be, truly, so powerful. My results with EyeQ were more mixed. First, a bit of background. I am in my late 50s. When I was in high school, my best friend and I enrolled in an Evelyn Woods speed reading program. Back in those dark ages, that meant going to a classroom with a live instructor and sitting with other students to learn the speed reading method. As the capstone of the course, they gave us a Hemingway novel and we read it in about 15-20 minutes with a high level of comprehension. Of course, it was Hemingway, so the sentences were short and simple. And the font was huge, so there were very few words on each page. But still, I was impressed. I knew that using normal reading, it would have taken me easily 4 or 5 times longer to do it. Then I went to college. I found that my speed reading skills were of no help at all. The weren’t going to help me with my math or physics textbooks. They weren’t helping me with my philosophy or Shakespeare books either. I tried to speed read and my comprehension with these dense books plummeted to zero. The only way I could get anything out of these works was to read them very slowly. And, when possible, reread them very slowly. So, I abandoned speed reading. Fast forward a few decades. I tried Photoreading. This was a course that I did at home. Its foundational principles purported to be neurolinguistic programming and hypnosis. Fortunately, the producers of that program were honest and legitimate. After completing the entire program I returned it for a full refund. In the meantime, I had, over the years, accumulated a couple of speed reading books. One was Stanley D. Frank’s The EvelynWood Seven-Day Speed Reading and Learning Program. The other was the revised edition of Peter Kump’s Breakthrough Rapid Reading. I subscribed to a number of magazines. Reading them every week as well as the newspaper could be a burden. For decades I used speed reading methods on this low-value materials. 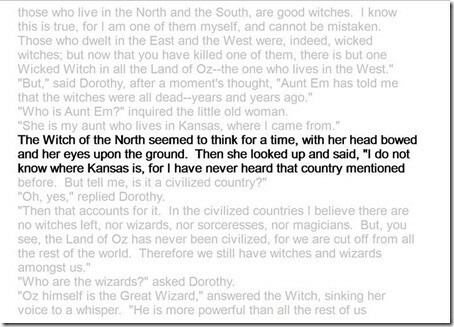 Gradually, I started speed reading on selected books. I gradually learned to calibrate more carefully where and when to speed read. My suggestion is to buy the Kump book. I believe that it will get you as much benefit (or lack of benefit) as any of the more expensive courses. Way back when I first went to the Evelyn Wood program, they taught me something the value of which I only began to appreciate two weeks ago. They taught me to take notes on a reading only AFTER closing the book. I never did that until I recently read about the research of Jeffrey Karpicke and others on “retrieval practice.” Research now confirms that the best way to acquire knowledge from written material is to read it multiple times, while taking notes from memory after each reading. In summary, read JD’s 10 December, 2010 blog post on msdn.com. He gives a great summary on what it takes to improve one’s reading speed and comprehension. Unless you do not care about saving money, choose the least expensive method of increasing eye speed. For most of us, that means buying a book. Of course, if you lack the discipline to follow the program that’s given in a book, then by all means buy something that will motivate you more. Since I have prepaid for a year of EyeQ online, I will be using it for many more months. If I find a need to revise this rather negative comments, I certainly will. @ moises — Great job sharing your personal experience and insights. That’s the kind of depth and experience I like to see. I suspect with your extensive background in speed reading and photomemory, your gains won’t be the same as somebody who’s new. You probably already learned how to focus, how to scan, what to skip, etc. I think the key is always knowing where your bottlenecks are, and where the gains come from. My biggest bottleneck was actual, physical eye-speed. For me, the software and the game of it, helped coach my eyes to go way faster than I thought they good, beyond the books, or my finger, or my simple desire. The immediate feedback of the software and the tracking makes a big difference, too — since, I find that progress inspires. One important thing I’ll point out about physical eye speed is that it tends to decline with age. A doctor that I know addresses this by working on the circulation to the eyes. What I don’t know yet, but am curious, is if the physical eye exercises in EyeQ improve the circulation — after all, you’re working the muscles, very intentionally. My eyes do feel stronger and faster, and whenever they slow down, I find EyeQ helps me get my speed back. The Evelyn Wood research founds interesting. I think what it’s pointing out is that testing your recall, helps reinforce your memory. Thanks Moises, that was fantastic I’ll check out the kump book.